1.Place roasting rack in large roasting pan. Place ham, cut side down, on rack in pan; add 1/2-inch water to pan. Cover ham loosely with aluminum foil; let stand 30 minutes. Preheat oven to 325°. Bake ham 1 hour. 3.Brush ham with some glaze; bake, uncovered, 20 minutes, brushing with glaze after 10 minutes. Remove ham from oven; increase temperature to 400°. Brush ham with glaze; sprinkle with breadcrumb mixture. Bake 10 minutes longer or until internal temperature reaches 135° and breadcrumbs are browned. 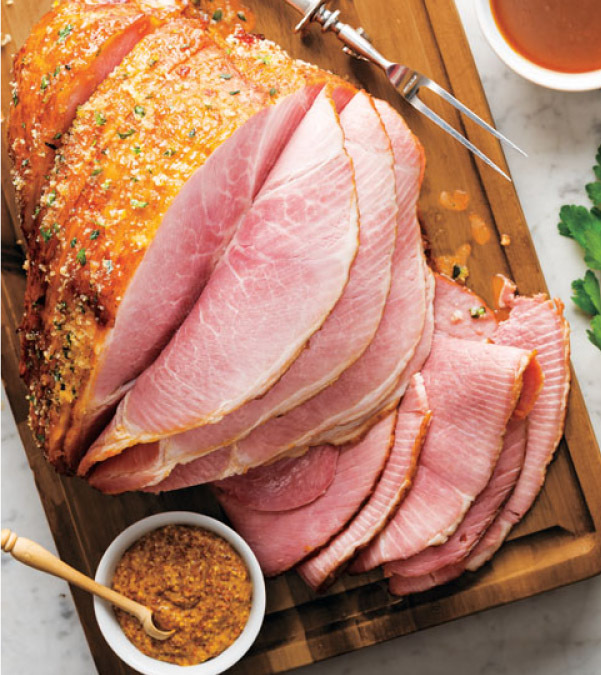 4.Transfer ham to serving platter; cover loosely with aluminum foil. Let stand 15 minutes before serving (internal temperature will rise to 140° upon standing). Stir water into remaining glaze; serve with ham.